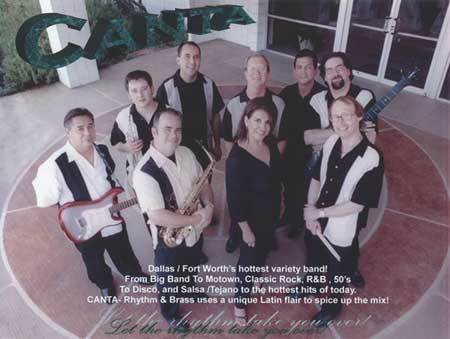 Canta... a Fabulous Variety Band! Canta will captivate any audience and engage a party atmosphere at every appearance! 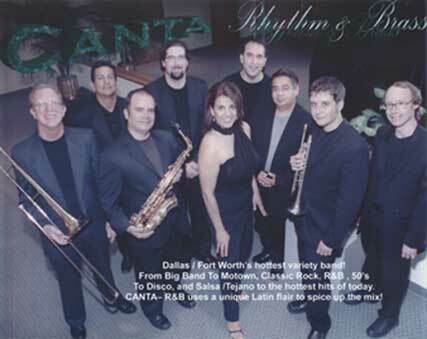 Taking audiences' of all ages and nationalities on the most exciting and diverse ride over the musical map, Canta Rhythm & Brass makes big tracks from Big Band to Motown to the hottest music of today with a unique Latin flair! Canta jazzes up the race by mixing over 39 years of experience; a vast, festive repertoire; and professional attitudes and combining it with exceptional talent to create the hottest sound around! 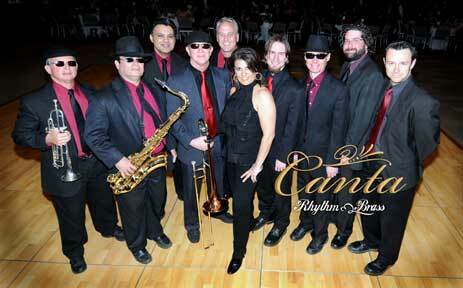 "Canta was the perfect band for our wedding! Lisa and the band did an outstanding job, and we received lots of compliments!" "Lisa and the band were awesome!" "HI! I just wanted to send an email letting you know how amazing Canta was at the Barrister's Ball for Texas Wesleyan Law School in April. I have been meaning to send this email for weeks, but everything has been extremely crazy these past few weeks with finals and then graduation, so I'm sorry it has taken me so long. Canta was fabulous!!! Lisa was so nice to work with and so sweet- she took care of everything and was always available to answer all my questions. She went over song options with me and even offered to coordinate the female singer's clothing with our party's colors! Canta was so lively and super entertaining- everyone was up dancing! I recommend Canta for any type of event 100% and would use them again in a heartbeat for another party! Thank you so much for recommending we use Canta! They really made the event so much more memorable!" "They were great. Everyone loved them! Very family friendly." "I can say without a doubt that LISA and THE BAND did an outstanding job!! They added the extra 'touch of class' to my parents' Golden Anniversary. Thank You!!" "Lisa and her band were an absolute pleasure to work with. They did an incredible job at our party!" "They were very flexible, which is something that was asked of them at the last minute the members had nothing but great things to say about them. THANKS!" "Dear Carol Marks, Canta played at our daughter's wedding in Paris, Texas on May 28, 2005. It is a fabulous band. Canta played the perfect background music during dinner and then revved it up for the dancing. I've never seen so many people dance for so long. The variety of instruments and wonderful vocal were a hit. Paris and all of our out of town guests (which were numerous) hadn't seen anything like them. So, please forward this and tell them thank you, thank you, thank you. I didn't have a chance to tell them after the bride and groom left. Best regards."